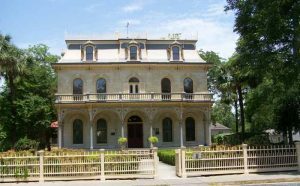 Whenever my daughter and I have a need to go downtown in the morning, we like to go for lunch at the Guenther House - an old San Antonio mansion converted to a restaurant, museum and retail outlet, in the middle of a pleasant green garden a little way south of downtown San Antonio. The Guenther House was originally built by a C.H. Guenther, a German immigrant who relocated from the Hill Country, and established a mill on the San Antonio River. Cannily, he figured that there were several mills grinding corn and wheat in the Hill Country, but none in San Antonio. He built the house for his family right next to his mill - and there it still is, the Pioneer Flour Mill, with a crenellated tower that can be seen for miles. The little store sells all sorts of cooking implements and products from the Mills; mixes and flavorings and things, and Pioneer Flour Mills products are also served in the restaurant. The food is good, and served either outdoors in a garden pavilion, or inside. One of the dining rooms is in what was garden room, on a half-basement floor, with windows on three sides looking out into the garden, a lovely little room in green and white, with a floor in mosaic tile, and stained glass in the transoms, hanging plants, and Chinese-style lanterns in metal and alabaster-finished glass. 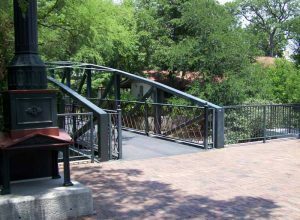 This is a pocket-sized historical district - San Antonio's very first first upscale suburb. What with one thing and another - and C.H. 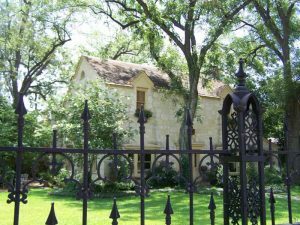 Guenther was just one of the first - it became a popular location for the German business element in San Antonio to build their houses, starting in the 1850s. 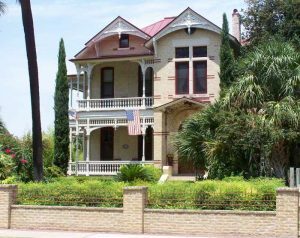 Frederick Law Olmstead visited, around then, noting that San Antonio was equal thirds German, Anglo and Hispanic - and all as distinct in their manner of building and dress, as well as language. There are other metaphorical old friends, along this street: This is the Steves house. The Steves were from Comfort, originally. I wrote of them in Adelsverein: Book Two, as neighbors of the Beckers. One of the Steves sons was the second school-teacher in Comfort. There was a Steves son and a son-in-law who were Unionists during the Civil War, and were killed in the massacre of Unionists in the Nueces Fight. 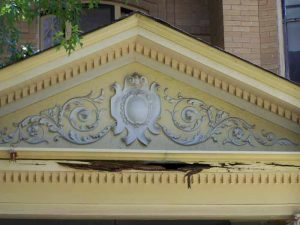 Although it is a historical district, not all the houses are quite so well kept: some are a little battered, a little overgrown, and broken up into several units. Keeping them together and air-conditioned in the summer must be a veritable money-pit. We walked back along the river-front, admiring the back-gardens of the houses on either side. In 1855, Olmsted had written that all the very nicest houses were built along the river, with bathhouses and little cabins for swimming and soaking in the cool water all along the banks. My daughter says that when I am a rich and famous writer, one of these old San Antonio houses shall do very nicely.